Last night was another bar night with friends specifically those us still alive & left who were around in the 90's underground gaming scene. 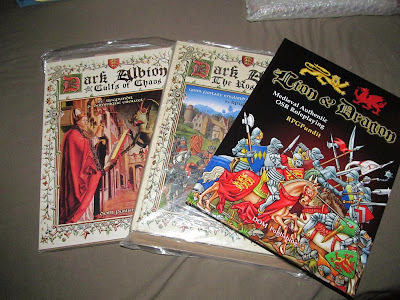 The late 90's to early 00's saw the hobby scene change in Connecticut when many established Dungeons & Dragons game campaigns coming home. The reason was simply, Magic The Gathering had made table space a paying premium for hobby shops. 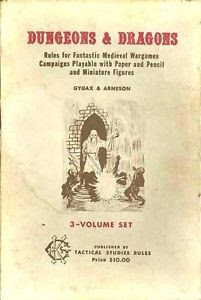 Dungeons & Dragons was out the door for players & dungeon masters. Dungeons & Dragons wasn't profitable. The D20 implosion had started & it took the feet out from under a lot of hobby shops. Economic conditions in Connecticut had worsened & so we took our games underground quite literally. A friend of ours had a house sitting service & with ten of us not partying, doing drugs,etc. the players had a floating campaign with all of the advantages. We had none of the drama issues that go along with hobby shop play. 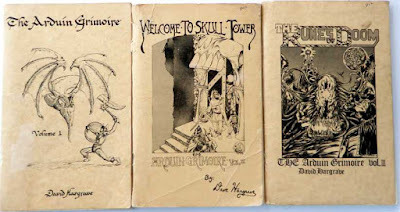 And we ran a combination of Arduin, original Dungeons & Dragons, B/X & some Advanced Dungeons & Dragons systems thrown into the campaign setting mix. We had a waiting list of players a mile long & everything was going well. Then like all big games campaigns it all fell apart with one car crash & our dungeon master partner having a heart attack. Arguments ensued , drama happened, a heated series of phone calls & letters, & just like that everything fell apart except for the four original players from War & Pieces in West Hartford. Our main villain of the entire campaign were the cults of Orcus & his undead servants! Everything was run as a 'convention adventure set up' a system that I still use to this day. A series of adventure events that are connected by little details but not scripted except as an over flowing of campaign setting events. Each adventure is isolated & non linear to keep things less rail roadie. So after everything fell apart I pretty much quit the whole hobby except running an expansive D20 & D20 Modern game for a long while. There were four players but gone were the halcyon days of the ten folks. Well no not really. I run convention style games at small private 'Con's'. These are affairs in Connecticut where friends get together each year for wargaming & con events because they can't get to 'GenCon', GaryCon, etc. because of work, scheduling, etc. Most of the time these are done among historians, book & game collectors, & the old gang.These aren't kids games with the youngest about thirty five or so. The set up for this campaign is the same as it was back in the Nineties with Orcus stretching his hands across Europe & the Black Plague is unleashed! "The Black Plague, was one of the most devastating pandemics in human history, resulting in the deaths of an estimated 75 to 200 million people in Eurasia and peaking in Europe from 1347 to 1351." "The keys to the 21 Hells have been unlocked & the plague is spreading quickly as the undead begin to feed! Ripples across time & space roil with the power of the demon god. The dead begin to rise & the power of Hell walks the Earth! Only a group of heroes can face down the minions of the demon god & hope to end this terror on Earth! " This is the adventure pitch that I'd recently run with Labyrinth Lord & Dark Albion at a private Con last year! We had seven players & the game was a blast as the PC's explored a plague ravaged village & dealt swiftly with the minions of Chaos! The PC's also found out that the Elves were behind unleashing the wrath of the demon lord. Coprighted & trademarked to Goblinoid Games & the artist. Now all of these elements are build into the Lion & Dragon rpg but its time that the hand of Orcus arise once again & claim what is his! 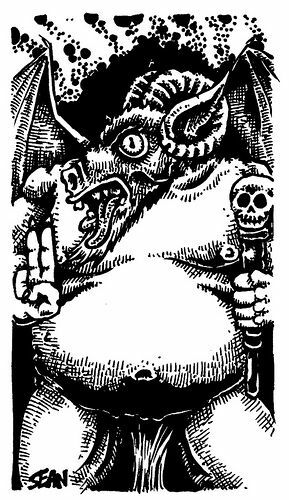 Across the OSR campaign settings your going to see LL's mascot's dark influence claiming what's his! More coming up! 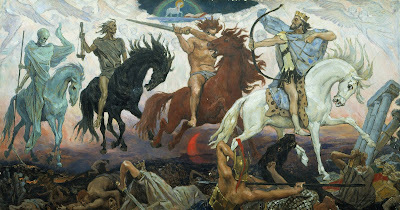 As the Four Horsemen are unleashed on the OSR literally!